“Dry Eye” is a term used to describe a group of conditions that cause irritation and damage to the ocular surface. There are many different forms of dry eye, each with a unique cause, and each with a unique set of treatment options available. The following video provides a brief introduction to dry eye disease, symptoms of dry eye, and several potential causes. Understanding Dry Eye Disease from Vision Source on Vimeo. Not all of these symptoms are unique to dry eye disease, but if you are experiencing any of these, you may have dry eye. A thorough ocular surface evaluation with our dry eye specialists will determine whether dry eye is present, and if so, what type(s) of dry eye are affecting you. The tear film is composed of three distinct layers: a mucin layer, a watery (aqueous) layer, and an oil (lipid) layer. Each layer has a specific function that aids in the cleaning, protection, lubrication, and stability of the surface of our eyes. 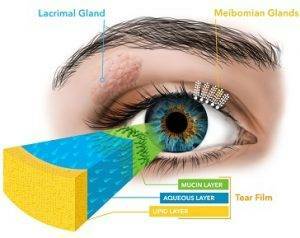 The mucin layer is the innermost layer of the tear film, and is produced by the cells along the front surface of the eye. This layer of the tear film helps to provide nourishment, and keeps the tears sticking uniformly across the surface of the eyes. The middle (and thickest) layer of the tear film is the aqueous layer. This watery portion of the tears is produced by a gland called the “lacrimal gland” which is located in the orbit above the eye. The aqueous layer cleans the surface of the eyes, washes away debris from the tear film, and provides hydration. Another important (and often unrecognized) structure that plays a critical role in the tear film is the eyelid. During blinks, a healthy eyelid acts as a squeegee or wiper (the “lid wiper”), to flush old tears into the drainage canals, and spread new tears into a smooth uniform tear film. Defects in the lid structure/lid wiper can cause damage to the eye from increased friction on the ocular surface, and poor movement and spreading of the tears. There are two major categories of dry eye disease: “Aqueous Deficient Dry Eye” and “Evaporative Dry Eye.” Each form of dry eye disease has a unique underlying set of causes, and each form of dry eye is treated differently. Proper treatment can only be provided after a thorough ocular surface evaluation to determine the cause(s) of your dry eye. Aqueous Deficient Dry Eye – Aqueous deficient dry eye occurs when your eyes do not produce enough of the aqueous (watery) layer in your tears. SEE TEAR FILM DIAGRAM. Normally, this layer of the tear film provides moisture, hydration, and a smooth clear surface for sharp vision. The aqueous portion of the tears is produced by a specialized gland above the eye called the “lacrimal gland.” If the lacrimal gland fails to produce enough fluid, aqueous deficient dry eye is the result. This type of dry eye may occur if the lacrimal gland does not receive appropriate feedback from the surface of the eye to produce tears (“reflex hyposecretion”), or if the lacrimal gland becomes damaged (age, systemic autoimmune disease such as Sjogrens Syndrome, or trauma). Evaporative Dry Eye – Evaporative dry eye occurs when your eyes do not produce enough of the lipid (oily) layer in your tears. SEE TEAR FILM DIAGRAM. The lipid layer of the tears is designed to seal the underlying tears to the front surface of the eye, preventing evaporation of the tears and providing stability between blinks. When our lipid layer is insufficient, the tears evaporate too quickly, starving the eyes of moisture, causing fluctuations in vision, and the frequent need to blink. The lipid layer of the tears is produced by a series of glands within the eyelids called “meibomian glands,” which release their oils every time we blink. If the meibomian glands are unhealthy, have become clogged, or start to die off, the lipid layer becomes deficient resulting in evaporative dry eye; this is known as “Meibomain Gland Dysfunction” or “MGD.” MGD is a progressive disease (meaning it will get worse over time if left untreated) that requires prompt intervention to ensure that glands are not permanently damaged resulting in chronic, incurable, dry eye! Tear Film – Lipid Layer from Joshua Lange on Vimeo. Vital Dyes – A colored drop is placed in each eye in order to highlight certain types of cells, or surface damage. Several different vital dyes are available. 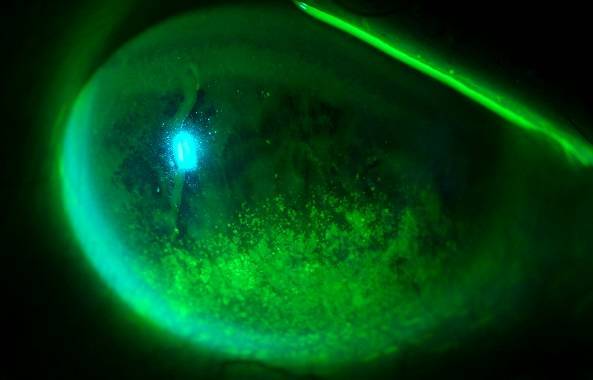 Sodium Fluorescein – Sodium Fluorescein is a yellow-colored dye (used in conjunction with blue light) that aids in the evaluation of the corneal surface. It allows the doctor to better identify corneal abnormalities, better assess the severity of surface damage, and measure stability of the tear film between blinks. Lissamine Green – Lissamine Green is a green-colored dye used to evaluate the cornea, conjunctiva, and lid margins (which act as a wiper to spread tears). This dye highlights both dead and damaged cells, and may be used to identify areas of the ocular surface that are undergoing early cellular changes associated with dryness, before it becomes too severe. Rose Bengal – Rose Bengal is a red-colored dye used to assess the cornea, conjunctiva, and lid margins. This particular dye may highlight any cells and mucins on the ocular surface, but only in areas where there is a break in the tear film. Tear Measurements – A series of tests may be used to evaluate the structure and function of the tear film. These measurements help to determine the volume of the tears you produce, how effectively they are swept away, and how long they remain stable in the surface of the eye between blinks. Tear Meniscus – The tear meniscus is measured simply using the doctor’s microscope (“slit lamp”) to quantify the height and volume of the tears on the surface of the eye. This test can help to identify cases of aqueous deficient dry eye (inadequate production of the watery layer of the tears). Tear Break Up Time (TBUT) – The tear break up time is performed using the same sodium fluorescein dye described above, and allows the doctor to visualize the lipid layer of the tear film. During this test you will be instructed to blink, and then to hold the eyes open (without blinking) while the doctor measures how long your tear film remains stable on the surface of the eye, before it begins to evaporate. A healthy tear film will last 25-30 seconds between blinks, before the tears begin to evaporate. Most patients become symptomatic for dry eye when their TBUT is 10 seconds or less. Phenol Red Thread – The phenol red thread test is a fast and easy test used to measure aqueous tear production. For this test, a small organic thread is placed along the lower lid margin for 15 seconds to measure the amount of aqueous tears produced. With healthy aqueous production, the phenol red thread should wick enough tears to extend more than 20mm down the thread. Aqueous deficient dry eye often produces measurements of less than 10mm on phenol red thread. Schirmer’s Tear Test – Schirmer’s tear test is another form of dry eye testing used to measure aqueous tear production. To perform the Schirmer’s tear test, a small paper-like strip is placed along the lower lid margin, and remains in place for 5 minutes to measure aqueous tear production. Healthy aqueous production will produce 15mm of wetting by the end of the test. 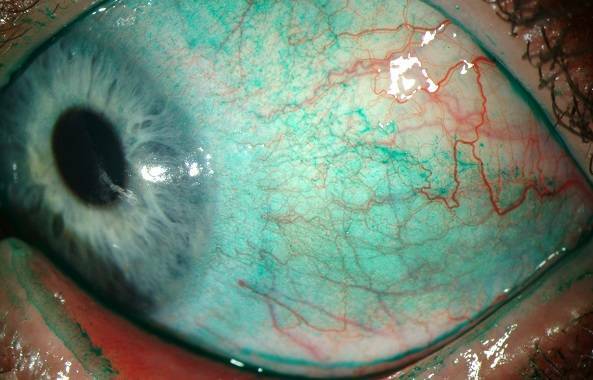 Increasing severity of aqueous deficient dry eye will result in increasing reduction in wetting of the Schirmer’s strip and may indicate mild, moderate, or severe dry eye, and even conditions like Sjogren’s syndrome. Blink Assessment – Healthy blinking is critical both in the production of tears, as well as the distribution and flushing of tears from the ocular surface. Factors such as lid structure, lid position, blink rate, and incomplete blinks all play a role in our tear health. All of these factors are assessed as part of an ocular surface evaluation. Furthermore, there are additional factors that may influence blinking such as the environment (humidity, temperature, airflow), activities (computer usage, reading), psychological condition (emotional state), and physiological factors (gender, medical conditions). Meibography – Meibography is a specialized imaging technique used to visualize the health and structure of the meibomian glands, which are located within the eye lids. These glands are responsible for producing the oils that stabilize our tear film between blinks. Recent studies show that some degree of meibomian gland dysfunction is present in 86% of patients who are experiencing symptoms of dry eye. For this reason, it is critical that any dry eye evaluation includes meibography! There are many different forms of treatment available for dry eye disease, and appropriate treatment varies greatly based on the form(s) of dry eye you are suffering with, and the severity of the disease. Treatments can range from at-home therapies, to in-office procedures, prescription medications, and more! However, not all forms of treatment are beneficial for all patients! Proper treatment needs to be tailored specifically to your eyes based on the type(s) of dry eye present. Aqueous Deficient Dry Eye – The goal of treatment in aqueous deficient dry eye is to increase and/or retain more of the watery portion of the tears on the ocular surface. Common treatments targeting this form of dry eye include temporary punctal plugs, permanent punctal plugs, and/or prescription medications. Evaporative Dry Eye – The goal of treatment in evaporative dry eye is to improve the lipid layer of the tears, to provide stability and prevent premature evaporation of the tear film. Common treatments targeting this form of dry eye include lid scrubs, BlephEx, LipiFlow, and/or prescription medications. All forms of Dry Eye – Some forms of treatment are designed to repair damage done to the ocular surface by dry eye, and may be effective for all forms of dry eye disease. These treatments include omega-3 supplementation, bandage lenses, amniotic membranes, scleral shells, and/or prescription medications. Properly assessing and diagnosing the type(s) of dry eye you are suffering with is critical to establishing an effective treatment plan.